An announcement that China was planning to gain access to dilapidated port facilities in Samoa in the South Pacific, has thrown US-led western allies into panic. The US imperialists assess the rapid rise of China as threatening traditional US hegemonic regional standing. 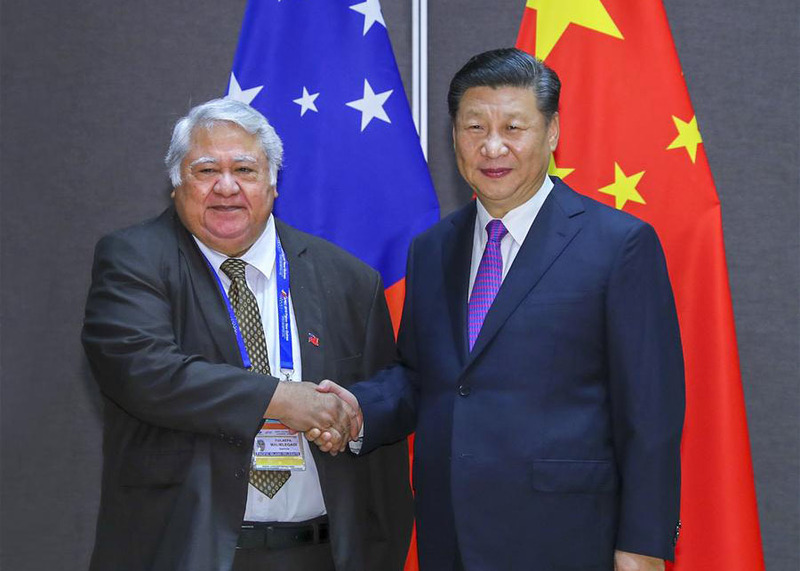 Chinese President Xi Jinping (R) meets with Prime Minister of Samoa Tuilaepa Malielegaoi in Port Moresby, Papua New Guinea, on Nov. 16, 2018. The western allies also fear the ability of China to use 'soft diplomacy' to extend their influence over the region, into areas historically under US-led tutelage. Their considerations, together with mainstream media releases, reveal a great deal about what lies behind political and military decision-making within the corridors of power in Canberra when dealing with sensitive defence and security provision. Once again, following the official media releases covering US-led military planning for the region, the story about China's role in PNG went very quiet. Samoans, who hardly possess the status of major players in Pacific Islands politics, must indeed wonder what all the fuss is about. The country, which gained independence in 1961, took a further fifteen years before even being admitted to the United Nations. While its main economic links lie with both Australia and New Zealand, the country has the status of being a Pacific backwater. They have also, like most other Pacific Islanders, lived alongside people of Chinese descent for centuries. Behind the terse nature of the assessment, however, lies the very real concern of US-led western allies that the rapid rise of China has already altered the balance of forces and challenged US imperialist control of the region. China, with relative ease, for example, successfully dislodged Japan as the world's second biggest economy. It now looks likely to topple the US by the middle of the next decade. Attempts by the US to contain and encircle China in the Asia-Pacific region and further afield have not been particularly successful. While the US has now fully implemented their regional triangular diplomatic framework with Japan as a fully-fledged northern hub for 'US interests' with Australia as a southern counterpart, Chinese diplomacy across the region has been spectacularly successful. The diplomacy has been based on ventures regarded as mutually beneficial, marked by a softer approach pursued amongst equals. Australian relations with the Pacific islands have usually been based in minimal aid allocations with regional military planning relying upon the host countries concerned and Canberra’s defence budgets. Very little sustainable development has taken place, with a lack of careful investment planning to facilitate meaningful economic growth with capital and labour. Many of the countries have relied upon Australian-based mining companies for mineral extraction as the basis of their economies. Australia, for decades, has also taken a declining role in the region; the support of governments was taken for granted, little was done in return. The old saying, the chickens have come home to roost, has a certain ring about it when looking at Australian-Pacific diplomacy. Decision-makers within the corridors of power in Canberra, formulating policy at the behest of the Pentagon, would now appear greatly concerned about previous complacency particularly when dealing with proposed Chinese port facilities across the Asia-Pacific region. They have conspicuously over-reacted. To what extent the present turmoil taking place inside the ruling Liberal Party with allegations of the organisation being 'taken over by right-wing forces', explains the over-reaction have yet to be established. (15) The Cold War political position of leading figures such as Peter Dutton, Minister for Home Affairs, however, may well explain extreme diplomatic positions being adopted toward China, with bureaucrats and administrators merely responding in the manner expected of their ilk. Examples of the behaviour of US-led military planners, and what they regard as the appropriate response to a perceived threat to traditional hegemonic positions, are revealing. The proposed port facilities being redeveloped by China in Samoa, however, have an entrance of 68 metres with a total depth of ten metres; the facilities, therefore, have extremely limited value for rapid deployment of military vessels. (17) Samoa is also placed a long way from possible theatres of war elsewhere in the region. Australia needs an independent foreign policy to distance ourselves from US-led warmongering! 1. China's Samoa port plan a concern, Australian, 27 November 2018; see also, China's plan to develop Samoan port a regional security concern, Fiji Times, 28 November 2018. 2. Pacific Votes For Future, Australian, 22 November 2018. 3. Prince Philip Movement: Prince Charles visits Vanuatu, where his father has a special past, ABC News, 12 April 2018. 4. Editorial, Struggle for supremacy in the Indo-Pacific region, Australian, 19 November 2018. 5. Warning over Manus navy hub, Australian, 20 November 2018. 6. Australian, op.cit., 27 November 2018. 7. Fiji Times, op.cit., 28 November 2018. 8. China's links with Fiji, Fiji Times, 18 May 2018. 11. Australian, op.cit., 22 November 2018. 12. Australian, op.cit., 27 November 2018. 14. Australia needs to show friends in the Pacific we mean business, Australian, 28 November 2018. 15. Deserter fuels Coalition chaos, Australian, 28 November 2018. 16. Allies join forces for standoff with China, Australian, 19 November 2018. 17. Australian, op.cit., 27 November 2018.